Those looking to declutter their home of any unwanted or broken electronic items are in luck. HOULTON, Maine — Those looking to declutter their home of any unwanted or broken electronic items are in luck. 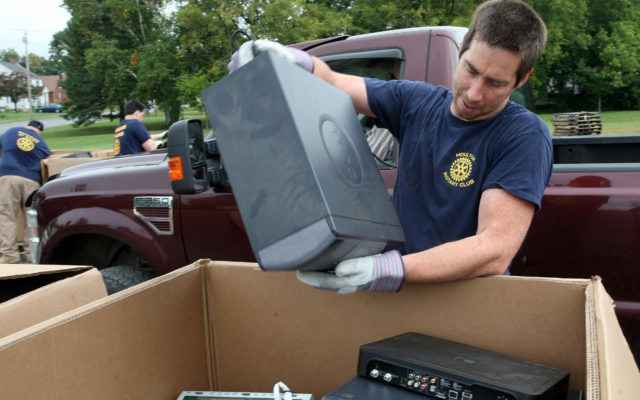 The Houlton Rotary Club and Aid For Kids is hosting its third annual “E-Waste Recycling Day” on Saturday, Sept. 8, from 9 a.m. to 2 p.m. at the St. Mary’s church parking lot located at 112 Military St.
Last year, Rotarians smashed their goal by collecting 76,243 pounds of electronics. In comparison, the 2016 event collected just over 60,000 pounds. E-Waste is the short name for “electronic waste,” which includes any electronics that are broken, outdated, no longer used or wanted, and ready for the scrap heap. Among the items accepted are televisions, computers, monitors, printers, copiers, fax machines, cell phones, microwaves, game consoles, cd players, dvd players, medical electronics, industrial electronics, lead acid batteries, mercury thermostats and portable electronic devices. There are some restrictions, though, as air conditioners, washers, dryers, refrigerators and freezers can not be accepted. Also, Rotarians ask that no light bulbs be dropped off. Simply tossing these items into a landfill is not good for the environment, Randolph said, and many of the components in the electronics can be recycled to create new devices. The Rotarians have once again partnered with Electronics End, LLC out of Brewer to haul away the items.